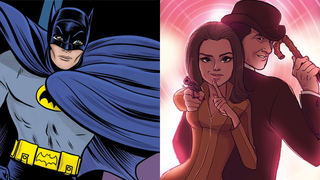 Batman '66 Is Crossing Over With the Avengers! No, the Other Avengers. The finest hero to have ever Batusi’d is teaming up with The Avengers—but we’re not talking about Marvel’s mightiest heroes. We’re talking about Great Britain’s! Out of all of the comic books news coming from Comic-Con this weekend, this might just be the craziest. Batman ‘66’ is locked in a period of time, and who he meets is locked into that time period. I can’t think of anyone more fun to use than those guys. So what better way to do that than to team up with a ‘60s TV icon from across the pond? For those not familiar, The Avengers was a long-running spy-fi series that aired in the UK between 1961 and 1969. Combining James Bond-ian spy action with science fiction, The Avengers followed the adventures of John Steed (played by the recently departed Patrick Macnee) and a variety of young female assistants—most notably Dame Diana Rigg (who you might be more familiar with as Olenna Tyrell on Game of Thrones) as Emma Peel. The show is considered a cult classic in the UK, and came back into the spotlight a few years ago when Marvel had to change the name of their first Avengers movie to Avengers Assemble in the UK to avoid brand confusion with an—incredibly turgid—1998 movie version of the TV series. Also announced at the panel were two new entries in DC’s line of “Earth One” graphic novels, which retell the origins of classic DC heroes on an alternate Earth (designated Earth One, and not to be confused with another alternate Earth called Earth-1. Oh, comic books). Aquaman: Earth One will be written by Francis Manapul, while J. Michael Straczynski, who kicked off the “Earth One” line, will pen The Flash: Earth One. Although details on either project are scarce, both are due to be released in 2016.